This exhibition focuses on the life of Reverend William Henry Lax during the period when he was minister of Poplar Methodist Church, East India Dock Road, Poplar. Minister; politician; orator; author; actor; local, national and international hero! All of the above terms can be used to accurately describe Reverend William Henry Lax. Few men can lay claim to such an impressive list but then Reverend Lax was no ordinary minister. A truly dedicated and inspirational person, during the first half of the 20th century he worked tirelessly for the Methodist Church and the local community of Poplar. Perhaps it is surprising, therefore, that awareness, understanding and recognition of the life and work of this enigmatic, influential and important figure in the history of Poplar is not more widespread. On a recent visit to the former site of Poplar Methodist Church on East India Dock Road/Woodstock Terrace there was only a small reminder of the minister who dedicated so much of his life to the area. This consisted of a small wall plaque on housing in Woodstock Terrace with the title ‘William Lax House’. Thankfully, however, Reverend Lax’s legacy lives on in the records of Poplar Methodist Church [W/PMC] which are held at Tower Hamlets Local History Library and Archives. This archive includes a wide variety of records relating to the church, spanning approximately 150 years and including some of its most famous minister’s personal records, such as, his writings. This material provides evidence of the church’s activity in the 19th and 20th centuries and highlights Reverend Lax’s vital contribution to the Poplar community during his time as minister of the church. 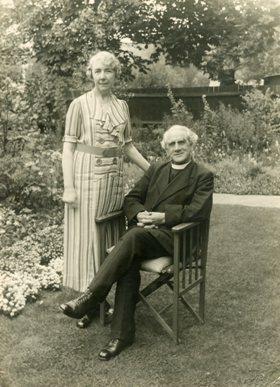 Reverend Lax was born in Chorlton upon Medlock, Lancashire on 5 January 1868, his family later moved to Hindley, near Wigan, where Lax was educated at the Hindley Wesleyan day school. He was an avid reader and became apprenticed to a printer at the age of fourteen. He subsequently followed his father and uncle as a Wesleyan local [lay] preacher and was acknowledged to be an impressive public speaker, despite having previously suffered from a debilitating stutter as a teenager. Lax went on to work in a post on the Isle of Man and then trained as a minister at Didsbury College, Manchester, 1892-1895. After working at Leeds Central Mission, he moved to London in September 1897 to work with Hugh Price Hughes at the West London Mission. On 2 August 1899 Lax married Mary Ann [Minnie] Browell [1877-1943] at Old Ford Wesleyan Chapel, Bow. Minnie was the daughter of Lax’s first superintendent minister, Robert Browell. Reverend Lax accepted an appointment to the Poplar and Bow Mission in 1902, by which stage the once thriving Poplar Methodist Church was in decline, due mainly to the migration of the middle and artisan classes to the suburbs. He inherited a Gothic Chapel with a small congregation and office-holders resistant to change but over the next thirty-five years he turned the church around and made it famous world-wide. A great orator and writer, he worked with passion and dedication to inspire his local community and expand his congregation; in return he was loved, respected and revered. The renown of Poplar Methodist Church’s minister was reflected by the way he was referred to simply as ‘Lax’ and ‘Lax of Poplar’. Indeed Reverend Lax was such a well known personality at one time that his own name was synonymous with the church itself. Therefore [during and after his ministry] Poplar Methodist Church was often referred to as ‘Lax’s Church’. This name was so imbedded in the consciousness of the church’s congregation, that the church’s premises on East India Dock Road was still being referred to as ‘Lax’s Church’ long after Reverend Lax’s death in 1937 and as late as 1976, when the building was being demolished. As part of these developments Poplar Methodist Church converted a redundant chapel in East India Dock Road [the former United Methodist Free Church], into King George's Hall and Institute, which was opened by the Duke of York on 15 November 1920. King George's Hall was an important venue for groups to meet and socialise and included a cinema. On 9 September 1940 a landmine fell between the Church and King George's Hall. Sadly the Hall, which had been such a core part of the church's social events and activities, was devastated and never used again. It was demolished in 1961. In 1927 Poplar Methodist Church purchased 'Cliff Edge', a convalescent holiday home for children and older people, located at Minster-on-Sea [Isle of Sheppey, Kent]. The early 1930s saw the major reconstruction of the Poplar Methodist Church building. Annual festival bazaars were organised by the Church and helped to provide necessary funds to support its many activities and premises-related work. Reverend Lax wrote a number of best-selling books which were autobiographical and anecdotal. In 1934 he also had a starring role in the Religious Film Society's film 'The Mastership of Christ' [the title was later shortened to 'Mastership']. Lax was a Liberal politician and actively participated in local government. He was co-opted onto Poplar Borough Council as an alderman in 1906 [and served until 1923], was chairman of the Food Control Committee during the First World War and Mayor of Poplar in 1918-1919. Reverend Lax enjoyed what can only be described of as a kind of celebrity status. His ubiquity was reinforced by the unusual decision by the Methodist Church to keep him in the same post, for an almost unprecedented length of time. The extent of his fame and renown was reflected in the manner in which the news of his death [on 6 February 1937] was received. Lax's death was widely mourned, with George Lansbury [the well known local politician and former Leader of the Labour Party, 1932-1935] broadcasting a tribute to his old friend, thousands filing past the coffin [as it lay in state at the mission] and crowds lining the streets for his funeral.